1500+sq.ft. townhouse with 3+bedrooms, 2 baths, indoor hot tub room, attached garage, 2 decks and a gas BBQ, Free clubhouse access to swimming pool, saunas, outdoor hot tub, tennis courts, etc..., sleeps 10. I grew up spending much of my summers on the beaches of Lake Tahoe and the slopes of Heavenly Valley. In high school I spent several weeks each summer hiking Desolation Wilderness and the Tahoe-Yosemite Trail. 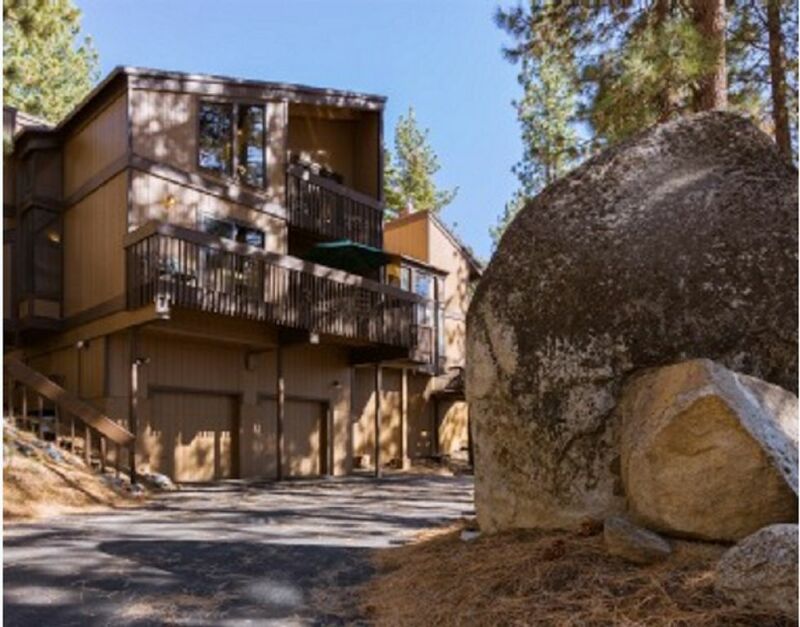 I could not imagine a better excuse for a business than to have vacation rentals in Lake Tahoe - Now I have to go to Tahoe every couple of months 'whether I like it or not!'. We hope we can share our Tahoe with you. Our home is in Lake Village. This has to be the most convenient location in all of Tahoe. You can walk to the beach or the casinos and yet the National Forest is right across the street. Lake Village features private town homes nestled into a 56-acre, heavily wooded mountainside dotted with granite boulders and pristine forest surroundings. We provide all the amenities of home, with all the extras of a true resort. Our private clubhouse is outfitted with a seasonally heated pool, hot tub and saunas, and features outdoor tennis and unlimited biking and hiking possibilities. Our home has a 2 story vaulted ceiling great room, an attached garage and parking for 3 cars. There is an in-door private hot tub as well as numerous TV's, VCR's, DVD players, and games such as Foosball and board games. toilet, combination tub/shower, Bathroom off the master bedroom. toilet, combination tub/shower, Jack-n-Jill bathroom between the 2 upstairs bedrooms. Attached Garage and parking spaces in front of the house. All 5 TV's are Flat Screen LCD. 4' mini table at the house and a full pool table at the club house. some puzzles and a 4'x4' checker board table. No lawn, but we do have a 2 story climb-able granite rock formation in the front yard. Gas BBQ on the deck. One mile to Edgewood Golf course. At the clubhouse 2 blocks away. We have a private indoor hot tub room. We enjoyed our stay at Randy's. Had a great time in Tahoe during our stay. His place is cozy and clean. The tv's did not work for us...we struggled to get a hold of him so went the whole time without tv. We followed directions provided to a Tee repeatedly...but nothing we tried solved the problem. I noticed after the fact that his cell number was provided but it worked out anyways. This wasn't all bad...forced us to enjoy each other's company which we did! The hot tub didn't work either...it wouldn't heat up past lukewarm even when you turned it up to 104 and left the cover on it to contain the heat all day. The tub is pretty small too...only fits 2 adults comfortably. It's super close to Heavenly lift and lots of great restaurants and bars! Only a little over a mile down the road from Harrah's and Harvey's and the rest of the entertainment of Tahoe! If everything worked properly we would have given another star or 2. Randy's is a great value...you'll struggle to find a better bargain! Clean, well equipped, everything works. Thanks Alex. We appreciate the great review and hope you choose to come back soon! We had a very nice experience for a one day weekend stay. Randy was always at tentative and quick to answer our question. Absolutely no complaints. Randy was a great host and answered questions we had. Great location close to everything, yet secluded and in a quiet neighborhood. Thanks Gloria! We are glad you enjoyed your stay. We stayed here the end of July. Lots of space and well equipped with all you need. We loved the location as it is close to everything. The clubhouse pool is very nice and within walking distance. The kids loved the checkers table! We did feel it could use a few minor upgrades and we had some issues with getting the hot and cold water to work for the washer, all in all, not a major deal however. We also had a few noise issues with the neighbors but got that resolved quickly with onsite staff ( absolutely no fault of the owners here) Otherwise, it more than met our needs! Our door code was not functional on the second to last day of our stay and Randy very quickly got it reprogrammed for us in a matter of a couple of minutes! Great space and Tahoe is beautiful in the summer. We enjoyed our vacation! Also, checking into our home is easy! There are no keys and you do not have to "check-in" anywhere. We use an internet programmable front door lock. We send you a unique 6 digit code that you punch into the lock, get a green light, and rotate the lever. Everyone can use the same 6 digit code- No keys to pick-up, hand-out, lose, or return!